BLACK EMERGENCY MANAGERS ASSOCIATION INTERNATIONAL: 2017. Is your community, your neighbors prepared? CERT. FEMA. and community engagement. 2017. Is your community, your neighbors prepared? CERT. FEMA. and community engagement. What about CERT in your community? Use the system to your advantage. Why re-invent the wheel, when only new spokes are needed. 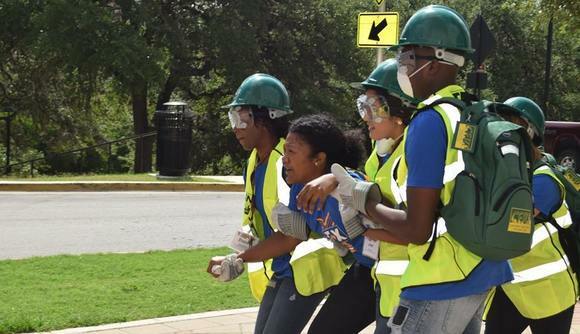 The Washington, D.C. Community Emergency Response Team (CERT) sought to refresh its training and recruit new volunteers with a unique Prepareathon event. In April 2017, Serve DC, which is part of the Mayor’s Office of Volunteerism, invited DC CERT members and the public to its office for a full day of emergency preparedness training and disaster simulation. The event covered active shooter training, disaster simulation and evaluation, refilling CERT bags, and hands-only CPR Training. The goals were to generate awareness for the city’s CERT program, recruit volunteers, and refresh the training of its current team members. The DC CERT program began in 2004 and amassed roughly 140 members that deploy regularly. They work local events, like parades and national events, including the Presidential Inauguration. At the January 2017 Presidential Inauguration, 50 CERT members supplemented the District of Columbia Department of Human Services at warming stations. In their most recent deployment, 30 CERT members conducted wellness checks during a power outage at a senior living facility. More than 70 people participated in the April event, as well as 30 members of the Federal Emergency Management Agency’s (FEMA) FEMA Corps. The FEMA Corps is a full-time, team-based service program for men and women between the ages of 18–24, who dedicate themselves to disaster preparedness, response, and recovery. Stevens says Serve DC hopes to work with FEMA to provide CERT classes as part of the initial FEMA Corps training. The DC CERT Prepareathon event made an impact internationally. A group of exchange students attended the exercise, and Stevens reports they want to bring emergency preparedness back to their home campuses in East Asia. DC CERT members participate in the Serve DC Prepareathon event. shooter,” and walked participants through how to act in such a situation. The program taught the “Run, Hide, Fight” response, which means either running to safety, hiding from a shooter or, as a last resort, fighting the assailant. learn how to respond to stressful situations. The disaster simulation portion of the event focused on fire suppression, search and rescue, cribbing or using wood to secure debris, triage simulation, as well as education on disaster medical treatment. for the one we have coming up in a couple of weeks. So, it was kind of like dangling the carrot in front of the rabbit.” In fact, more than 40 people attended the following week’s CERT training and 16 others signed up for the next training. but they need improvement on triaging and carrying survivors. For more information on Serve DC or DC CERT, visit https://serve.dc.gov/. The Federal Emergency Management Agency (FEMA) encourages Community Emergency Response Teams (CERT) throughout the Nation to join the American Red Cross Home Fire Campaign. This initiative works with local fire departments to install 100,000 smoke alarms this summer and fall for local Sound the Alarm community events. Since its formation in 1997, 485 volunteers have completed training from Florida’s Cape Coral Community Emergency Response Team (CERT) program. These training opportunities not only cover basic CERT class topics, but they also offer more diverse topics to fit the community’s needs. Recruiting volunteers and obtaining needed equipment and resources pose a challenge for some Community Emergency Response Teams (CERTs). Identifying solutions to address these challenges remains critical for maintaining an active and effective team. Disclaimer: The reader recognizes that the federal government provides links and informational data on various disaster preparedness resources and events and does not endorse any non-federal events, entities, organizations, services or products. Please let us know about other events and services for individual and community preparedness that could be included in future newsletters by contacting citizencorps@dhs.gov.